I was reading an article about cute little piggies. I was also having a discussion with my grandson Tyson last week about eating foods at restaurants when they leave the heads on them. I have huge issues when it comes to eating food that still has the heads on them. 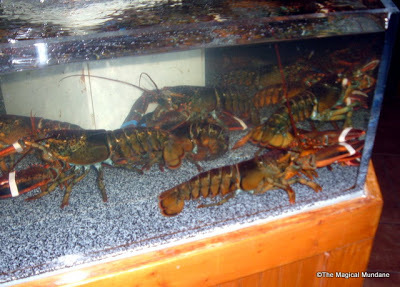 For example, when I go to Red Lobster, the first thing I see when I walk in is the lobsters that are in a tank. You can choose which one you want to eat for dinner. I’m sorry, I just can’t get past the idea of how they were alive a few minutes before and now they are looking at me on my plate. There are times when I think I could totally become a vegetarian when it comes to seeing the animals before they die. We had a bull and we named him Ricky. He was an awesome bull. Well, we didn’t own him, our landlord did. We just did everything for him since his landlord wouldn’t feed him or do anything with him. There came a day when the landlord came over to kill and butcher Ricky. We were suppose to get half the meat since we paid for everything for him. When the time came and we were given the meat, I couldn’t do it. I couldn’t get past the images of Ricky standing there by me and wanting petted. 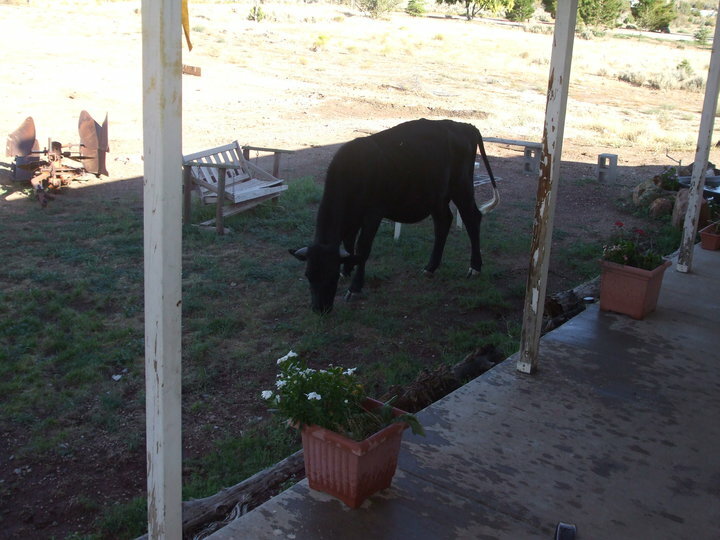 He would break out of his fence area and come up to the house and would look in the windows as if he wanted to come in. We ended up giving the meat away since I couldn’t handle eating him and neither could my husband. When I was younger, my parents would race animals and then we would butcher them. One of the cows we had his name was Charlie. Us kids would play with him and he was so awesome. When the bus dropped us off, the first thing I seen was Charlie hanging from a tree. To this day, I have that image in my mind. I stopped eating beef until I knew that all of the meat was gone that was from Charlie. My parents did the same thing with a couple pigs we had. We called them Betty and Jerome. They were named after some good friends. We came home and Jerome was hanging on the same tree Charlie was. It was fruits and vegetables for me for a long long time. On the page I went to, the people were told that they were going to do some taste-test sample of bacon. Instead they were shown a little baby pig. There is something about looking into the face of a cute baby piggy and then the idea that it will be killed so I can have bacon. I think I would like to keep the piggy alive and skip the bacon. When they seen the little piglet face to face, they melted away. I wonder if people were to look at the animals they are eating face to face if they would turn vegetarian. I can see myself doing that with no problem at all. As I said earlier, my grandson Tyson and I were talking about the lobsters at Red Lobster. All I can imagine is these lobsters that was alive as I walked in are now being put in a boiling hot pot and screaming to the top of their tiny little lungs. They are saying, “Help Me, Help Me, Please“. Then boom, they get boiled alive. People say they can’t feel, I don’t know if I agree with that one. If they are screaming and trying to claw their way out of the boiling pot, then I would think they were hurting. If I order lobster or another seafood, I make sure there is nothing looking at me. I love Alaskan King Crab and lobster, but not if I see it alive just a few minutes ago. I would be more apt to buy it and then set it free, lol. Then there is fish. Specifically Trouts. I love Rainbow Trout. But, when a restaurant decides it is a great idea to give me the whole trout, head and all, I am sick to my stomach. Here is this trout that has these eyes and mouth staring at me. Even though I know it is dead, the reality is that it was once alive and gasping for air as it died. Oh my goodness, all kinds of thoughts runs through my mind at that point. So, I loose my appetite since I am looking at this face. I wonder if he is the daddy to a trout like little Nemo. Instead of taking care of it’s fishy family, it is deader than dead on my plate with a knife and fork ready to dig in. At that point I have to get a hold of the waitress to have the head removed or change my order. I am done by that time. Down the street from me there is a restaurant called the, “Gun Barrel”. It serves all kinds of game meats and such. Now the issue I have is when I walk into restaurants like this and they have what was once alive heads on the walls. While I am eating whatever it is, there are eyes staring at you. Yes, the animals heads on the wall are dead, but at one time they were alive. Egads, I can’t have body-less animals staring me down. There are actually a number of restaurants that use these heads as decor. I hate it and I can’t handle it. One of my favorite restaurants has one placed over their fireplace. I can’t eat in that section. I’m not sure why I am a person that eats meat since I feel the way I do. I love a good burger or whatever else as long as I can’t see the body before hand. I also know that if the animal is being killed to feed people, then that is fine as long as they are humane about it. It bothers me when people kill animals just to kill them. If they are going to go hunting, I would hope they are doing that to feed their families or others who need to eat. I don’t like it that animals are killed just for the sport of it or to have the animal sitting on a mantle or wall. Previous End of the World – Could It Be Sept 28th?